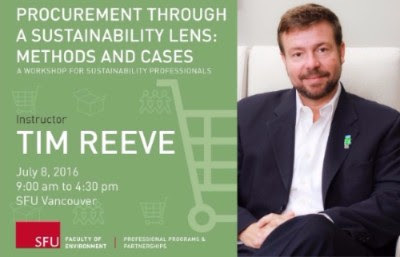 Last week, we let you know that Tim Reeve will be running the “Procurement Through a Sustainability Lens: Methods and Cases” course on July 8th, at SFU’s Vancouver Campus. This week, we have some exciting news: there are bursaries available to NGO’s and small firms who wish to take this course! If this sounds like you or someone you know, please contact Joanna Ashworth at joanna_ashworth@sfu.ca. As part of SFU’s new Integrating Sustainability Professional Program, Tim is presenting “Procurement Through a Sustainability Lens: Methods and Cases”, a full-day workshop on how purchasing can be used to advance your organization’s sustainability priorities, and how to make sustainable purchasing work on the ground. Tim will be joined by guest speakers from Vancity and SFU, and will present and analyze numerous case studies to uncover best practice sustainable purchasing examples.